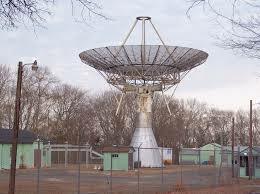 We at the American Treasure Tour love to call out smaller museums that may have limited funding to advertise, and we continue that tradition today with our call out to the InfoAge Science History Museum located at Camp Evans in Wall, New Jersey. One word of warning: do not be scared away by their name. There is SO MUCH history in this facility - a former military base not too far from the Shore in New Jersey - and it's not all about science. In fact, Camp Evans is a collection of a number of museums brought together in one large space. So, if you don't have an interest in wireless communication (Camp Evans was one of the first Marconi radio centers in the world) or the birth of weather tracking and radar, there's plenty else to see - early radios and televisions, the beginnings of computer technology, exhibits on shipwrecks, military history, and model railroads are also here - with a collection of World War II-era vehicles to boot. And what makes your visit even better is that you can talk with some of the volunteers whose enthusiasm keeps this place alive! It really is a cool place, especially if you're into technology. And it's not far from Allaire State Park, a historic industrial town, also in Wall. So much to see, so little time.